So you’re interested in joining the River King Newfoundland Club but don’t know any members, and you’re wondering how you find someone to sponsor you as an applicant. The best thing to do is to attend a few RKNC meetings and events, which you’ll find listed in the online calendar. All general meetings and events are open to prospective members, and you can simply show up unannounced if you wish (though contacting the club president probably wouldn’t be a bad idea) and you are encouraged to attend one or more of these. (Hey, we’re all dog people, so expect a warm welcome.) This is probably the best way to begin meeting other club members and finding a sponsor. Go to the “Event and Awards” page at the AKC’s website. This page should come up with “Conformation” already selected; if you’d rather search for an obedience or rally trial, just click on the the “Obedience/Agility/AKC Rally” tab. Conformation is by far your best bet; at a conformation dog show, you’ll be able to know exactly when Newfoundlands will be in the ring, and you’ll even be able to know how many are entered. On this page will be a clickable map of the U. S. which will allow you to select the states to which you want to limit your search. The River King area covers only parts of Missouri and Illinois, of course, though depending on where you live you may wish to select other states. (You can also, if you wish, use the “Select Breed” dropdown menu to choose Newfoundlands, though that’s not necessary; that will simply bring up the number of Newfs that attended any given show the previous year.) Once you’ve selected your state(s), click “Search” to get a list of all dog shows scheduled for the next 8 – 12 months or so. The first column will provide location; the second column gives the date of the shows. Scroll down to find one that you’re willing to drive to. Now that you’ve found a show you’d like to attend, what next? Don’t just show up at the show site and expect to see Newfs; it may be that none are actually entered, or it may be that you’ve arrived at 9.00am and Newfs don’t show until 2.00. What you want to do at this point is to mark your calendar — not just for the date of the show you want to attend, but also for several days before the show. Also make a note of the superintendent of the show (listed in the “Superintendent/Secretary” column on the AKC web page). Why several days advance notice? That’s when you want to go online and check the judging program. That program will tell you how many Newfs are entered in that show and what time Newfs will be in the ring. From the home page of any of these superintendents’ websites, you’ll be able to get to the Judging Program. On Onofrio’s site, select the “Show Information” tab then “Closed Shows,” then scroll down to find the show you plan to attend. Click on the highlighted name of the kennel club sponsoring the show, then scroll down a bit to see if the judging program is available. On Foy Trent’s site, mouseover the “Show Information” tab then select “Closed Shows”; scroll down to the show you’re interested in, and if the judging program is available, there will be an active link to it. But don’t get to the show at the last minute: some dogs are absent, some judges are fast, things happen and that 10.50 start time for Newfs could suddenly be 10:33. Ideally, get to the show an hour or so before the Newfs are scheduled to show, then walk through the grooming area; since it generally takes an hour or more to show groom a coated breed like Newfs, you’ll surely see Newfs up on grooming tables. This is the time to introduce yourself and explain your interest in Newfs and the RKNC, but keep in mind that most folks will need to concentrate on getting their dogs and themselves ring-ready, so introduce yourself and ask if you can chat after Newfs have shown. Everyone’s more relaxed then and most people will be more than happy to “talk dog” with you. Keep in mind that some of the Newfs you see will be with professional handlers, and the owners of those dogs might be at the show, or might be hundreds or even thousands of miles away; in other cases, the Newfs will belong to people who are not RKNC members. A few quick questions will let you know. If you want to attend an Obedience or Rally trial (very few Newfs do agility, so your chance of running into one at an agility trial is small), follow the first couple of steps above but click on “Obedience/Agility/AKC Rally.” Select your states and the events you want to search for (again, you can probably skip agility), then click “Search” and you’ll get a list of obedience/rally trials. Finding Newfs at obedience and rally trials is harder than finding them at dog shows. Trials are often run by dog training or kennel clubs directly — that is, without the use of a professional superintendent — so they may not publish their judging programs online, although some do. If the obedience/rally trial is held in conjunction with a conformation dog show (a not uncommon occurrence), then a superintendent will be involved, and the judging program, which can be found as described above, will include the schedule for the obedience and rally rings. Yet even if the judging program is available online, that won’t help you know when Newfs are showing since obedience and rally are organized by class (that is, the “level” at which dogs compete), not by breed. And unless you know what class a particular Newf is competing in and what that owner’s armband number is — and if you know that, you don’t need this webpage — there’s no way to know ahead of time when a Newf will be in the ring, or even if there are any at that particular trial. If there are Newfs at the trial — and River King has some members who are very active in obedience/rally — you should be in luck, as many owners of obedience dogs will hang out at these events both before and after their dogs have competed, and in some cases (dogs competing in multiple classes) dogs will be at the show site for hours (though they can be harder to spot when crated, which most are when they’re not competing or about to compete. Look for the big crates!). A good rule of thumb, if you want to attend an obedience/rally trial and take a chance there’s a Newf there, is to get to the site by 9.00am. If you’re near the St. Louis area, which is pretty much at the center of the River King region, there’s a good chance that you’ll find a few Newfs at any given obedience / rally trial, many of which (though by no means all) are now held at the Purina Event Center at Purina Farms in Gray Summit, MO. 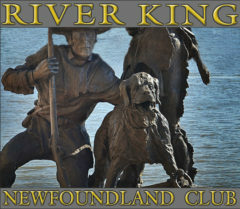 Thanks for your interest in River King Newfoundland Club — hope to see you soon!